Athletic toads? Rats gambling in a dollhouse of decadence? How about bespectacled gentlemen lobsters? 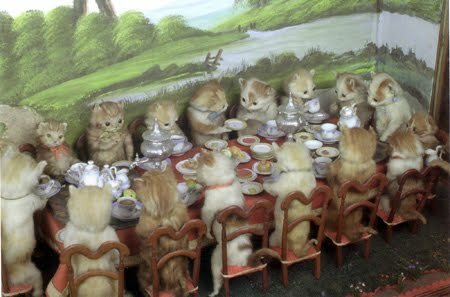 No, this isn’t Wes Anderson’s sequel to Fantastic Mr. Fox, but the work of English Victorian taxidermist Mr. Walter Potter. Potter was famous for his over-the-top anthropomorphic scenes—kittens at the tea table; guinea pigs playing cricket—which were displayed in his Museum of Curiosities from 1861 until 2003 when his wondrous collection was sold in a contentious auction, which I attended in Cornwall. Had Potter attended the Great Expo (very likely) he would have seen among the taxidermy displays a comic depiction of Goethe’s fable Reinecke the Fox reenacted with semi-human foxes. Sounds childlike—and it was in the best, most passionate way—but in the days before irony anthropomorphism was a form of endearment (imagine Beatrix Potter, no relation). More so, the facial expressions were expertly manipulated, raising the taxidermic bar and inspiring followers. You can read the full article on the Wonders and Marvels blog by clicking here. You can find out more about Milgrom's Still Life--which contains a nice discussion of Potter and his work--by clicking here. If the life and work of Walter Potter is of interest, I also highly highly recommend that you check out the wonderful, lavishly-illustrated Walter Potter and his Museum of Curious Taxidermy, written by Congress for Curious People lecturer Pat Morris; you can do so by clicking here or by visiting Observatory (more on that here). All images are of Walter Potter's work and are drawn from the wonderful Ravishing Beasts blog; you can see them in context by clicking here.